What a wonderful, funny, weird, frustrating mess. First things first: Sherlock’s back, and while it might be only for 90 minutes, it’s a welcome return. It looks like this will be the only time we get to spend with Holmes and Watson (at least with this version of the pair) until 2017, since Benedict Cumberbatch and Martin Freeman are quite busy being movie stars. It would have been understandable, and even oddly sweet, had this special been what it seemed to be from its promotional materials: a romp into the past, removed from the show’s larger narrative, and a brief taste of something to hold audiences over until season four. Just a nice little New Years’ gift from Moffat and Gatiss, right? Nope. For better or worse, “The Abominable Bride” fills an unexpected gap in the narrative of the series, giving us the few quick minutes (or longer—it’s unclear how long he’s out) that immediately follow the moments that closed out ”His Last Vow,” the season three finale. In addition, what seemed like a standalone mystery was anything but. The titular bride was lots of things—a red herring, a symbol, a useful tool, a creepy publicity still—but the focus of the story she wasn’t. Instead, viewers were treated (or not, depending on your reaction to the episode) to an extended deep-dive into Sherlock’s mind palace, courtesy of his horror, insecurities, and a complex little drug cocktail that makes Watson’s eyes pop right out of his head. So yes, the key that opens this special can be found in its conclusion, but since it takes nearly 90 minutes and a lot of misdirection to get there, it’s impossible to leap right to the end and ignore its many parts. 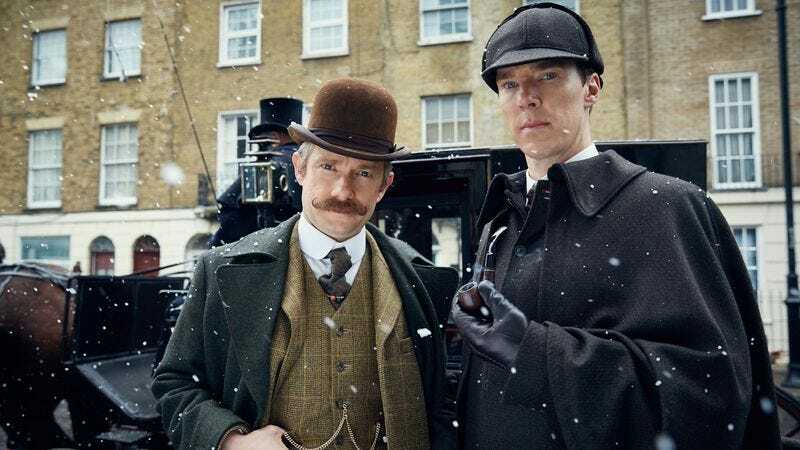 How is “The Abominable Bride” to be evaluated? Waving the bulk of the episode away because it existed only in Sherlock’s head seems inappropriately dismissive—Watson may be the beating heart of the series, but its eyes, ears, mouth, and mind have always belonged to Holmes. Given how much care went into making this, and how much pleasure it contains, that hardly seems right. And yet it feels that Sherlock did exactly that, and dismissed the bulk of the story as nothing more than a means to an end. There are more right notes than wrong ones to be found in “The Abominable Bride,” and believe me, those will be discussed below, but the big, tone-deaf elephant in the room is this: create a narrative arc that’s all just a function of Sherlock’s mind if you must, but perhaps don’t make the key to that arc that fact that women are ignored, dismissed, put-down, and controlled, then make the reason for that arc’s existence so that one man can solve a mystery about another. Much about the mystery that the Victorian iterations of Holmes and Watson chase packs a hell of a punch, and as an idea, it’s rich territory. Thematically, it opens a door to a conversation about Sherlock’s relationship to women (and emotion as a whole) that ranks among the best Holmes-Watson scenes the series has to offer (“Dear lord, I have never been so impatient to be attacked by a murderous ghost”). It gives us the unexpected treat of a righteously angry Molly Hooper in drag, the fun of listening to Mrs. Hudson object to the fact that she never has any lines in Watson’s stories beyond opening the door and fetching tea, and a few solid zingers from both the past and future Mary. And historically, the sight of the women in those hooded robes calls to mind some uncomfortable truths about the suffragist movement and current issues with feminism and race—intentionally or otherwise. Still, the feminist turn the episode seems to take—the story of the war the men must lose—reaches us through male voices, right up to the end. What do we learn about the thoughts and feelings of Emilia Ricoletti (Natasha O’Keeffe)? Not much. Who explains, not only how the crime was committed (well, sort of) but why it was committed? A man, surrounded by a room of mostly silent, mostly nameless women. When the bride finally appears again, who’s under the veil? Not Emilia, but Moriarty (welcome back, Andrew Scott!). And why was any time spent on this story at all? So that Sherlock can puzzle out how, exactly, his presumed-dead rival has popped up on televisions throughout the U.K. The story of marginalized women creating their own terrifying mythology doesn’t matter at all. It’s just a part of the mind palace. It’s a stepping stone. It was just there to fetch the tea and answer the door. Points for trying, Sherlock. Truly. However mishandled, any piece of mainstream entertainment that aims to raise issues of inequality should be praised. But my oh my, they really didn’t stick the landing. It’s a common theme with this episode. So much of what happens in “The Abominable Bride” is successful: predictably excellent performances, check; razor-sharp dialogue, check; lush visuals, check (those floating newspaper clippings!). Add in incredible costuming, a few well-earned scares, and some fun fan-service, and you’ve got a hell of a recipe for a moody, Holmesian confection. Then, with a few tiny hints dropped along the way and that first, jarring right turn into the present, “The Abominable Bride” poises itself to become one of the best episodes the series has offered thus far. And then it doesn’t stop. And it still doesn’t stop. And it keeps on not stopping. Giving viewers the chance to spend 90 drug-fueled minutes rocketing through Sherlock’s mind-palace is an idea so wholly unexpected and promising that the very first indication that past and present were linked (to my eyes, when Sherlock mistakenly says “he” when wondering how Ricoletti put a bullet through her skull and survived) sends a jolt of electricity through an already promising story. That first abrupt awakening in the plane is more thrilling still. It’s a narrative choice so bold, so full of writerly swagger, that it seemed impossible that they wouldn’t pull it off. But they didn’t. Somewhere between the next trip back, the grave-digging, and the dive off Reichenbach Falls, the episode had one plum pudding too many and decreased its life expectancy. When the fun Victorian murder mystery became a trippy, death-defying dive into the recesses of a brilliant but deeply troubled mind it soared, but the step past that one, and all the steps that followed, mired those exquisite moments in self-congratulatory muck. Am I inclined to be forgiving of “The Abominable Bride”? Yes. Perhaps on repeat viewings, as more delicious tidbits float to the foreground, what’s good here (and there’s so, so much good) will cancel out the massive belly-flop that so soured the ending. And to be clear, that doesn’t mean the final moments, which work just fine—of course Moriarty is dead, but that doesn’t make the threat of what’s happening any less real, and the knowledge that Sherlock’s got it solved doesn’t make the cliffhanger any less enjoyable. It’s what the final scenes tell us about all that came before that spoils all the wonderful things that came before. And what wonderful things they were. It would be easy for Sherlock to rest on the charisma of its leads, on the crackerjack dialogue, on the effortless style with which it tells its stories—but it never does. Even a deeply flawed story that aims as high as this one does will always be more interesting than one that plays it safe. It’s never twins. Not even secret twins. I know Andrew Scott’s performance isn’t to everyone’s taste, but the more grandiose and mad he goes, the more I love him. Bless his scenery-chewing, gun-licking, mumbling, veil-wearing little heart. I hope that whatever organization is using his image keeps doing it and we see a lot more of him when season four finally arrives. If someone doesn’t start cosplaying Molly Hooper in 19th century drag, I will lose faith in the world entire. Is there anything scarier in the series than seeing Sherlock disconcerted? Every time Cumberbatch looks even a little bit worried, the tension immediately mounts. Obviously this review focused mostly on the structural issues of the writing, and it’s easy to praise the quick one-liners and the twins and the potatoes, but there was some seriously beautiful writing here. “The shadows that define our every sunny day,” etc. Elegant, simple, and incredibly effective. Other great little things: Lestrade’s facial hair; Mycroft’s feast for one; Irene Adler in the locket; that great second take on Holmes and Watson’s first meeting; the sound of that theme coming out of my television. Hey, everyone! I’m Allison. I’ll be covering Sherlock from now on, so I’ll catch you again in a year or so.